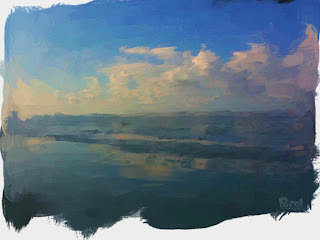 The family and I went to the beach for a weekend so I took some of the free time to do a few phone paintings. I figured I have not done one of these in a while so what the heck. By the way, I really sucked at plein air painting back in college. Why couldn't I digitally phone paint photos back then!? Oh right. It didn't exist yet. Damn! So the time has come once again to dig deep into the vaults of the Pinto archieve to show you how the fledging young artist began to cut his teeth. I don't really know when these were done but the best I can guess is around 1977-78. 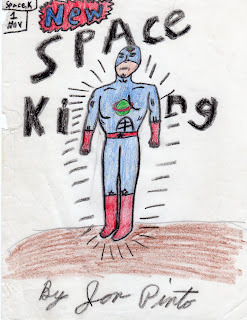 I always thought of myself as an undiscovered talent in the comic book market and was just waiting for Stan Lee to notice and put me to work doing whatever the heck I wanted and giving me a check for it. Sweet dreams of youth! I remember drawing this pic and worked pretty hard with a pencil and crayons to do my own inking and coloring and to pull off the cover of my comic. Notice, it's a first issue! Too bad there was never a second! I made this character up and I actually drew him for years after this initial foray. I changed the costume not long after and I even had an entire binder filled with drawing and tracings of the guy. I am pretty sure all those are long gone but at least I still have this, the original pic and that is thanks to my Mom. 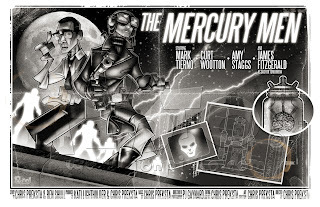 The Mercury Men! ...In Color!! I never actually intended this piece to be in color at all. In fact, most elements were done strictly in black and white as I thought it would be not only faster but more faithful to the fact that the series is in black and white. While painting the main characters (in color), I came to really start to sway, and when they were pasted into the final file, I knew that I had to make two seperate pictures. Turns out that since I had such editable layers, it was quite easy to do and lo and behold, color! I kept the distressing and such off of this one to make the two more distinct. As if one being full color would not be distinct enough! Anyway, enjoy this one as well as the black and white version and enjoy the time lapse video as well. Check out The Mercury Men here. Well here it is! This was SO much fun to do and I am really happy with the way it turned out. I thought from the beginning that doing a picture in black and white would be a fun challenge and really be fitting for this particular project. I also really worked at the "distressing" of the pic. 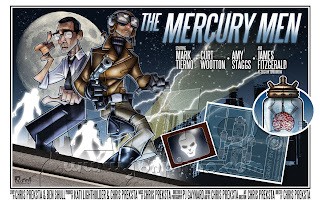 I hope you all like this and I hope you have all seen and supported The Mercury Men!! Here is a little bonus. I didn't mean to actually do this but this is what I got when I was assembling the parts into my compostion without all the paint and such. I thought it looked pretty cool on it own and just slapped on "The Animated Series" tag to complete it. If I actually put some thought into this one, I would have a clean blueprint and changed out the lightning and buildings to look more "toony". OK, so I decided to show you the layout of the final pic. I don't know why the final composition would need to be such a secret. Not rocket science ya know!! So here are my doodles, the digital mock up and an overlay. And thanks to Bret Melvin for guiding me towards how to lay this one out. I was headed in a totally different direction until talking to him about it casually at work. Just thought I would tease a bit today with a couple of screen grabs of the work in progress. These were shot from the final layout but in different stages of completion. Enjoy! 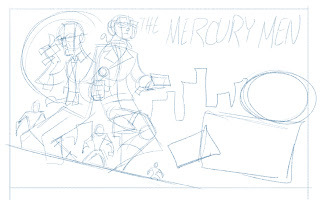 Here's an update of my Mercury Men picture. Really plugging along with the two main characters. The layout for the whole piece is done already. Thought I would go for an old fashioned, horizontal layout like the classic lobby cards. Also wondering if I should show that in it's raw form. Hmmmm................... . I'll think that over a bit. 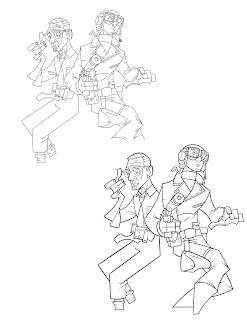 For now you can peek at the deadline inked and final inked figures. You can even print and color one if you like. Not too long ago I, and for reasons I can't recall, downloaded an app for my iPhone related to SyFy. After opening the app, one of the titles in the menu literally jumped out at me and slapped my face for attention. Ok, maybe not LITERALLY. Anyway, said "The Mercury Men". I had to find out what it was. What I found was awesome! 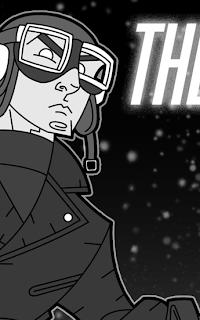 It's a sci-fi series shot in film noir black and white and cut into chapters like classic movie serials. An Indiana Jones like hero, space invaders, ray guns and a brain in a jar!! What's not to love??!! Not only are the episodes really fun but they also built a world of fake merchandise that makes me wish it was real! They have cereal box cut outs, fast food collectible glasses, action figures, 8-bit games, etc. And none of it is real. That's sounds odd, so you should just check it out for yourself. 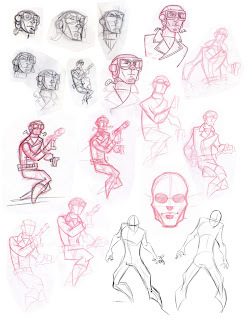 So here are some doodles out of my sketchbook of a Mercury Men piece I am currently working on. Just finished uploading my files to have my book printed. I had two samples printed almost a year ago and was quite pleased with the results. I have made a few tweaks to them and then added a TON of extra pages to it. It is a full 50 pages of sketches and final art all in full color. It's a softcover book but I am not looking at that as a detriment by any means. Also, my posters and oversized cards arrived and they look great!! Too bad the pics from my iPhone don't. Finally made it back to my Master series! 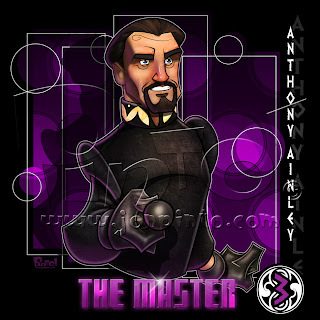 This one was really fun to do as Anthony Ainley was the first actor I knew that portrayed the character. In fact, I was surprised to find out that another person did it before him. I guess that makes sense since Peter Davison was my first Doctor. As usual, as of late, enjoy the time lapse clip of the making of the piece.